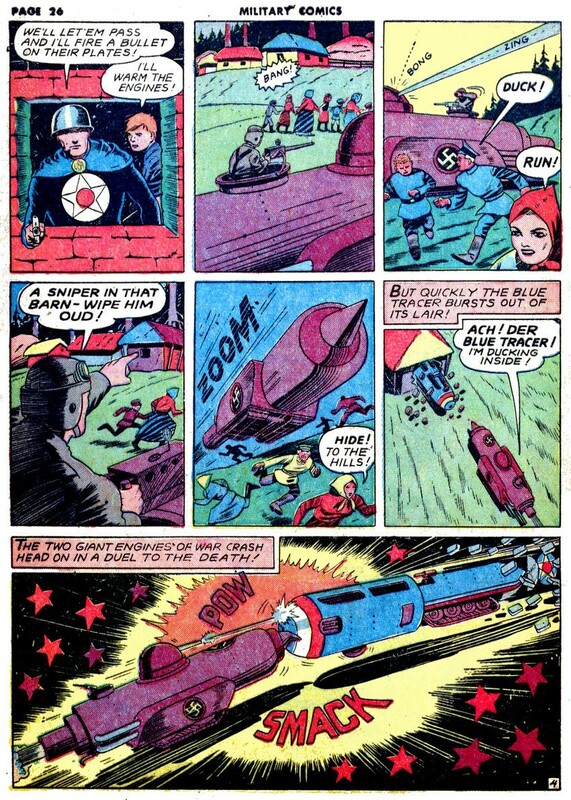 The Blue Tracer was a feature about a super tank, created and drawn by Fred Guardineer. 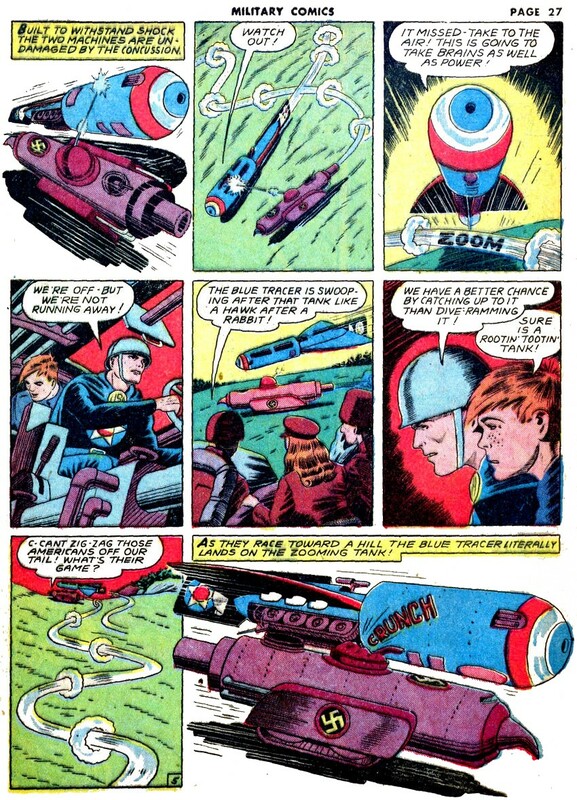 The Tracer could do anything: it had weapons, it could fly, go underwater, on land...and it was built by two guys, “Wild Bill” Dunn and “Boomerang” Jones. 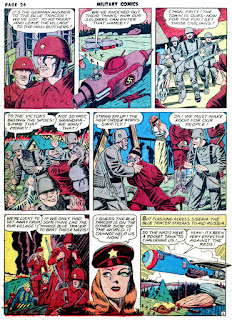 The feature did not last too long, from Military Comics #1 (1941) through #16 (1943). 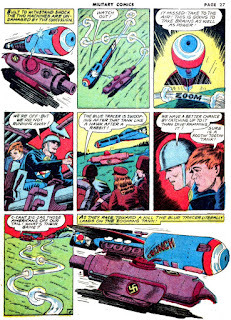 In 1975 Fred Guardineer re-drew the first episode. I showed it in 2009 from its appearance in Cartoonist PROfiles magazine. Just look for the link below. 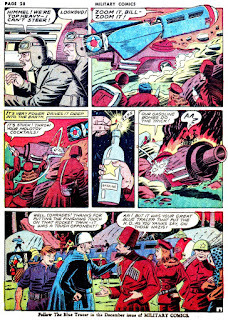 This episode is from Military Comics #13 (1942). 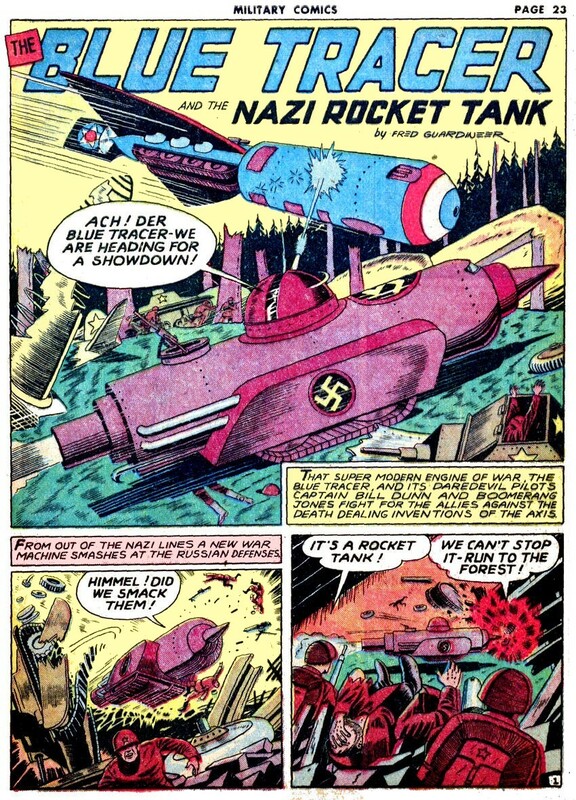 The Tracer is going up against a Nazi version of the supertank. 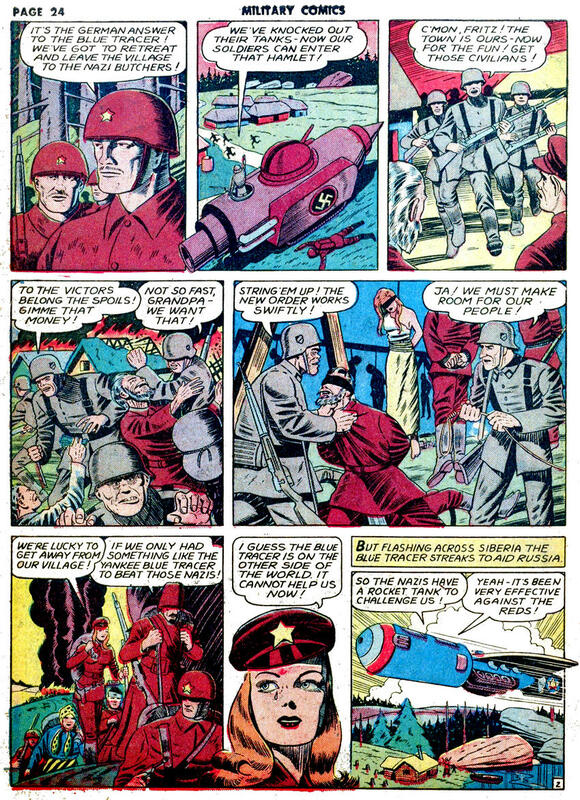 Our heroes have the help of the Russians, who before the end of the decade became the bad guys. At this late date I'm still reading about differences we have with Russia. * Sheesh. From Cartoonist PROfiles #31. Just click on the thumbnail. *C'mon, people! Let’s work together! "Let's work together", yes, at least until we reach Berlin... then we will see. Needless to say, I didn't know anything about this "Blue Tracer" (wonderful name). 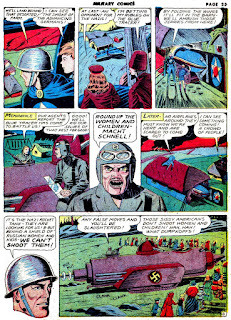 It is obviously a son of the"Submarplane" used by Mickey, from "the pirate Submarine" (1939). Have you ever thought, perhaps, that it could have been "we and the Nazis"? Just the wink of an eye, a twist of fate, and history could have taken a totally different track... (of course, I'm telling this because unfortunately, it WAS "we and the Nazis", from my point of view). 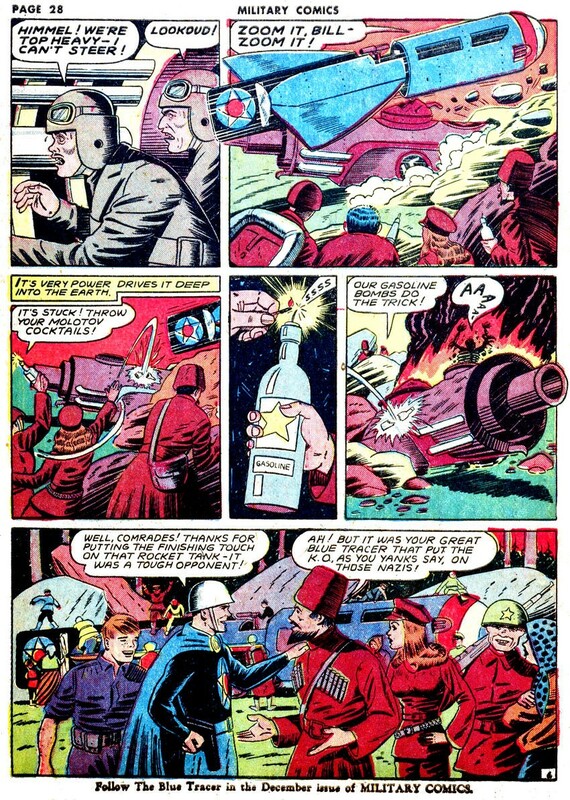 Visual inspirations: The Lovely Girl in Commie uniform (very effective, like in those Red Propaganda posters), the Good Old Cossack, and the Iconic Molotov Cocktail: yes, the super scientific Blue Tracer vs. the Supreme Nazi Tank, it's the Clash of the Titans. But it's a proletarian bottle filled with gasoline that ends the bout. Our pal, Molotov! Both Nazi Germany and Soviet Union developed very effective "super tanks" (the nazi Tiger-Panther, the IS "Stalin" tanks), but they didn't look like oversized boilers. 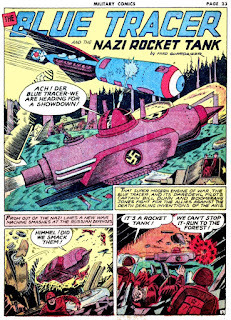 The super tank/plane, is an oldie but goldie, and always comes back. I remember the film "Damnation Alley", based on the novel of the same name by Roger Zelazny. J D, I'm fascinated by alternate histories, but we live with what actually happened. Decisions made during the war affect us to this day. 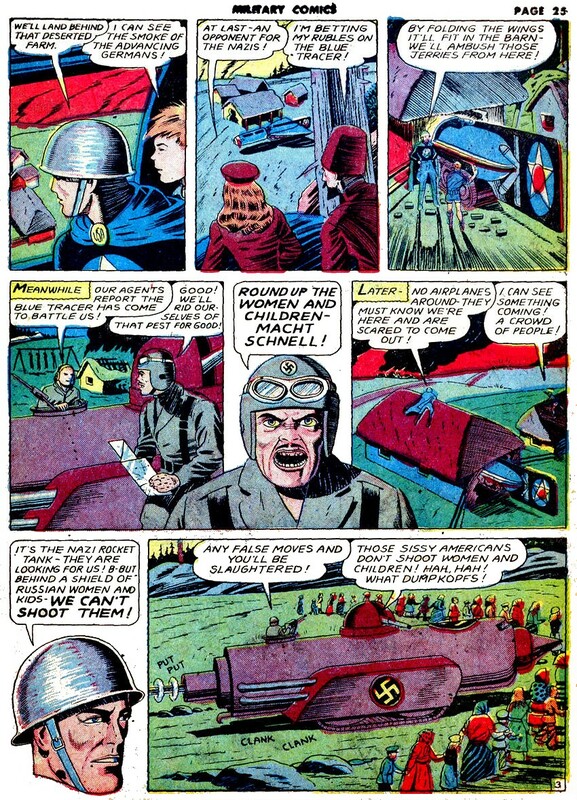 "We and the Nazis..." There was a strong sentiment in America to keep America out of the war. It is true that the largest segment of white America is German...statistics vary slightly, but around 50+ million Americans are of German ancestry. * There was support for Germany and the Nazis before the war, so who knows? 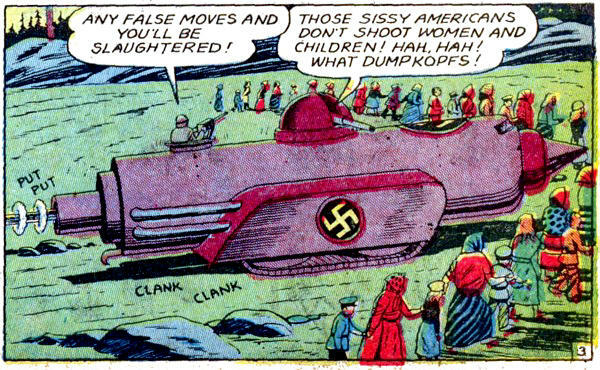 In an alternate universe they might have put America on Germany's side. 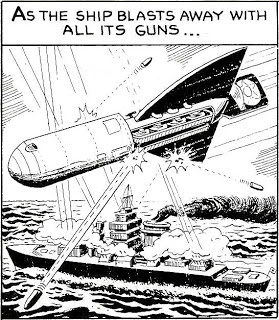 Science fiction devices for fighting wars always seem quaint to me. The real stuff is much more deadly. Machines that would have once been thought science fiction kill from thousands of miles away, for one. Drones in faraway places, piloted remotely by people in rooms in the heartland of the U.S., would have seemed a very exotic, and far-fetched idea had they been introduced in science fiction during the War. I like your description of the story as a "candy bar." Tastes good while you are eating it, but provides little nutrition. But at least this "candy bar" doesn't rot your teeth. *Italians come in eighth place, and Pappy's paternal ancestors, the Welsh, come in dead last on the Voice of America chart, right under the French Canadians and Russians. I'd seen the Blue Tracer previously, in the first episode and in the redrawn version of that first episode, and not thought much about it beyond noting that the writer didn't seem much to worry about how energy changes would affect those in the device. Now, I see the Nazi analogue, which is very, uhm … phallic, and realize that the Tracer largely is as well. I hope that Alicia and Debbie just somehow don't see this. Daniel, I am sure those grrrls won't faint at such a sight. OMG Daniel we skippded tha story thanx 2 ur warnering & went str8 2 tha Music Vid Yay! No need to resort to alternate histories. The Germans and the Soviets were allies until one of them could figure out how to slit the other's throat first. That lasted from 1939 to 1941. It might have lasted longer if Hitler hadn't decided the battle against Britain was taking too long and he opened up the Eastern Front. (I've seen an argument that Hitler was suffering from Parkinson's and had to hurry up his timetable because he knew he wouldn't be around long.) Ribbentrop and Molotov were even negotiating the U.S.S.R. entering the war as a fourth member of the Axis when Hitler ordered Operation Barbarossa. Number 1883: Bitten by escaped gorillas!